Paul Bennet’s life is marked by a continuing search for perfection and excellence. He is not satisfied unless he is learning, refining a skill, or conquering a challenge. Whether he is sailing a 16ft skiff on Newcastle Harbour, sailing a 50ft ocean racing yacht, or flying one of his 200mph radio control jets, or flying his 400hp Wolf Pitts Pro, Paul is Full throttle. 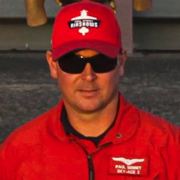 In airshow flying, Paul is one of the Australia and the world’s premier performers, in value for money, entertainment value, piloting skill, and professionalism. Paul has been performing at airshows since 2005, and has won numerous aerobatic competitions during that time. In 2009 Paul was crowned the Australian Unlimited Aerobatic Champion, receiving the Phillips Cup In 2009 Paul was crowned the Australian Unlimited Aerobatic Champion, receiving the Phillips Cup. In 2011 and 2012 Paul won Unlimited in both the Qld and Victorian State Championships. In 2008 Paul was crowned the Australian Advanced Aerobatic Champion. Paul has flown over 700 performances at over 300 displays, in front of several million fans. Paul is one of only a handful of Australian Pilots to hold a ground level aerobatics approval. Paul’s performance is a very professional, well rehearsed and exciting performance.